"I remember my father used to wake up at 4am," Ederson Moraes recalls. "He woke me up as well. We would leave home together, he was going to work and I continued my walk to catch the bus. I had my training session with Sao Paulo. I had to take two buses to the point I could take the club bus. "Same way return. Very often, when I was back home, I didn't have time to have lunch. I just had time to change my clothes and go to school. When I was back in the evening, I was exhausted. So, I used to have dinner and go straight to bed because I had to rest to follow the same routine the next day." Ederson was just 13. His father, Antonis Moraes, stacked fruit on to lorries in Osasco, on the outskirts of Sao Paulo, Brazil's sprawling, largest city. His son was "chasing his dream" of becoming a professional footballer. A dream that was fuelled just three years earlier on the clay pitch of a small, neighbourhood school, Champions Ebenezer, and would lead Ederson to board a plane at the age of 15, leaving his family behind, to try to make it with the giant Portuguese club, Benfica. "My head was only football," Ederson explains. "And I always thought I'd succeed." Many footballers, especially Brazilians, have astonishing back-stories. And Ederson is no different. He is, though, an interesting mix. The easy-going, somewhat shy, 24-year-old, is a devout Christian, and has a yellow, smiley emoji tattooed - one of 30 tattoos on his body - behind his left ear to show the world that "I'm a happy person". And the Manchester City goalkeeper smiles and laughs a lot. Then there is the fierce competitor who earned the nickname "The Bull" when he was at Benfica because of his fearless style. "It was my team-mates who called me that," Ederson says. "I think it's because I didn't fear to put my face or my feet in any situation if it was necessary, or having to put my face where an attacker was putting his feet." That bold style led to him pleading with City's medical staff to let him carry on after he was badly cut, down his left cheek, in a challenge by Liverpool's Sadio Mane this season. There was blood everywhere and Ederson eventually needed seven stitches, but he did not want to go off. "That incident didn't interfere with my confidence whatsoever, I kept playing the same way after that," he says. "The following day, I was training again as usual. If it happens again, I'll do the same. Hopefully, I won't get hurt again." Indeed, Ederson immediately told City manager Pep Guardiola that he was ready to play in the next game, away to Feyenoord in the Champions League, just four days later. And he played, wearing a scrum-cap. During this first newspaper interview since joining City last summer for £34.7 million, there is only one topic he does not want to discuss - what allegedly happened in the tunnel after the recent Manchester derby - as he covers his upbringing, why he became a goalkeeper and, intriguingly, what Guardiola said to him after he signed. It did not involve making saves. That is a given. "He told me the way the team play," Ederson explains. "He told me about the importance of the build-up, but also about the 'mid-balls', and with me he could also have 'long-balls', so our game was going to be more complete. "So, when I started training here, we worked a lot on that, the short, mid- and long-balls. Training session after session I got used to it and kept improving. Every day I learn something new." Ederson's ability with the ball at his feet is remarkable - his composure, the range and accuracy of his passing - and he has taken the role of the "sweeper keeper" to new heights. "I started playing as a full-back, but it's difficult to chase quick forwards, especially for me that I'm not particularly quick," Ederson says. "I had lots of trouble running after the forwards. I asked my manager (at Champions Ebenezer) if I could switch my position to the goal. When I did my first training session, it was love at first sight. I liked it since minute one and then my career as a goalkeeper started. "Also, I played futsal and that helped me a lot. I used to play as a goleiro-linha (fifth man), it's a goalkeeper that plays a lot with his feet. So, we used to attack with five players and defend with five. From that, I had my shooting skills and good footwork." What does he like about being a goalkeeper? "The responsibility," Ederson replies. "The goalkeeper has more responsibility. He can make five miraculous saves in a game, but if he makes one mistake, afterwards everyone is only going to remember the mistake. The goalkeeper is a crucial member of a team. The man who has to be more focused during the 90 minutes, be courageous and make quicker decisions. It's good to feel pressure and responsibility. It means you can't fail in the game." That bravery, he believes, is shared throughout the City team through the attacking style demanded by Guardiola. 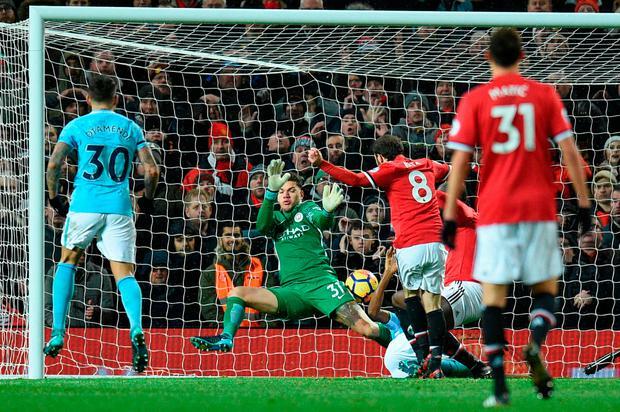 "The way we do the high pressure, we have to have our lines really far from the goal, lots of teams are playing long balls behind our defence line to put us in trouble," Ederson says. "Lots of times I have to leave the goal to block a ball. We need to be brave and courageous in this style of game, especially in the decision-making, which is the most important thing." Training at City is, therefore, different from what he has previously experienced. "We have a specific way to play here, with the build-up," Ederson explains. "My team-mates always offer me lots of lines to pass, so that ends up being easier for my role. I used to work on my footwork, but not as much as I do now. It's a style of football that you enjoy playing and you enjoy watching. I think our team has a lot of calmness with the ball. We know how to work well and wait for the best moment to attack. "I think it's great the way we play and the way we approach games. Our approach to football is a football of joy, the same joy that we do in our training sessions we show it later on match days. That joy ends up influencing our fans and the rest of the football fans because they enjoy how we play." And what of those tattoos? "There are a lot of people that might not like tattoos; I respect it. For me, it's my passion, so the same way I respect their view, I'd like everyone to respect my passion for tattoos. And when I look back (at my life), I look with a smile on my face. Daniel McDonnell Waterford owner Lee Power has called for a ‘full investigation’ into the FAI’s handling of the process which led to their rejection for a place in Europe this year.